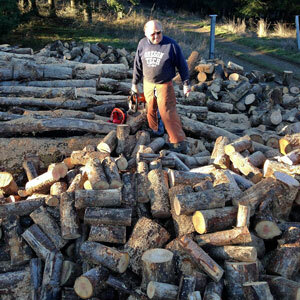 Oak Basin Tree Farm encompasses more than 600 acres near Brownsville, Oregon owned by brothers Jim and Ed Merzenich. Their property was covered with blackberries and slash piles when they purchased it. They have planted more than 200,000 seedlings and completed extensive brush removal projects. The Merzenichs have used Natural Resources Conservation Service programs to thin and prune more than 100 acres and clear another 60 acres of non-native species. They replanted more than 5,000 fir and cedar trees and have worked intensively to improve wildlife habitat. They used a Landowner Incentive Program grant through the Oregon Department of Fish and Wildlife to complete oak and oak savanna restoration projects. Their goal is to restore the woodland to a condition that more closely resembles what is believed to be the historical landscape of Oregon white oak savannas, upland prairies, and areas of mixed native conifers and hardwoods. For OWC, Jim produces essential oils using his own still and foliage harvested from his own trees, and also firewood for hardwood trees thinned from their forest.